Reserve the space early-You would be surprised how little space there is on my campus once the semester starts. We only have two ballrooms on campus big enough to have a full conference and of course, both of those spaces were taken for every weekend by the time I reserved a space last November. Therefore, I had to book a floor of our Student Success Center building. It can only hold about 100 people, but that’s all we need for the first year of this event! Form a committee as soon as possible- I started meeting with my committee in November of last year for an event that is happening February 27th. Even though we didn’t get a ton done the first month, it showed me who was willing to make the commitment in my office to help me when we were in the knitty-gritty details right now. 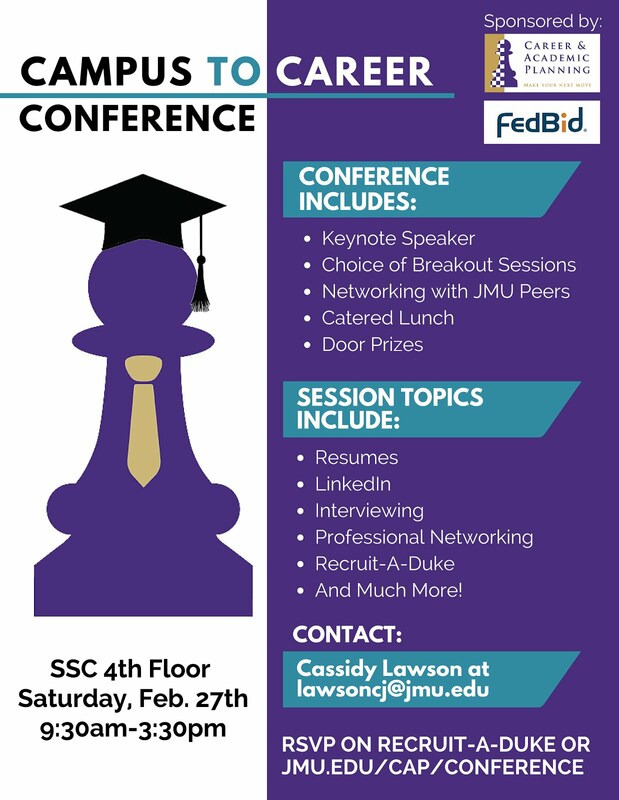 Be prepared for setbacks-During the process of planning this conference, I learned that our annual JMU Women’s Leadership Conference was being held on the same day and time. Even though we lost a few presenters to this conference and probably some attendees, you have to keep your eye on the prize and realize that your event is just as important and there are always more than enough students to share on a campus of over 20 thousand! Your marketing team is your best friend-I cannot emphasize how important collaboration is between your Marketing Coordinator/Students during this event. Getting the word out about a first time event on a huge campus is super challenging, but you would be amazed at how creative some of your colleagues can be! For people to show up to your event, they have to know about it so treat your marketers like gold, especially when you make last minute changes to your promo materials! Keep a positive outlook-Let’s be honest, planning events is extremely stressful. It seems like every day there is some new detail that you hadn’t thought about yet that has to be attended to. You stress daily about the attendance numbers, if people are actually registering and if the weather will hold off long enough for your event to happen. However, at the end of the day, you have to take a step back and realize that you are doing something AMAZING for your students and that whoever attends will reap so many benefits because of YOUR efforts! Pat yourself on the back and keep in mind the reason you started! 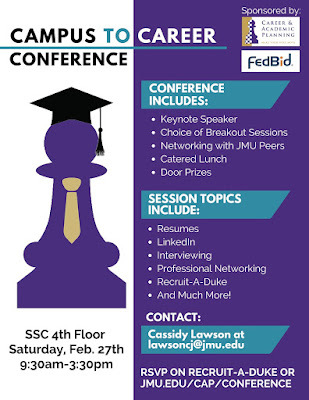 If you have any other questions about conference planning, let me know!